This graphic design project is for a 8-page mock-up of a medical booklet and cover. I can provide a template if you'd like from graphicriver. The Cover Design should say: The Vitrectomy Recovery Guide and you can choose a photo from any of the high-resolution photos we will provide. We have attached a design to give you a general idea. 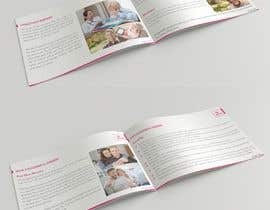 I would like someone to re-arrange the Booklet Content on a 5.5" x 8.5" Booklet we are going to be printing. Update on the booklet size! With the Retina Success vitrectomy sleep support unit, you can rest comfortably and safely with your face in the face-down position. This unit sets on top of your bed and acts as your pillow while yielding space so you can breathe. You can remain comfortably in the face-down position on the side of the bed. This is a great position for sleeping during your face-down recovery. Enjoy social gatherings, feasts or even play a board game with your family with the easy-to-adjust table support. These are a few bonuses you get with your order. Read a wealth of articles and watch patient perspective videos of who have had the vitrectomy surgery. We don't want you to have to worry about returning the equipment within 7 days, return it when you want and focus on recovery. Corrections are in proposal number 8. I am willing to increase the prize by $10. Show me the first 3 pages.